A tall, slender, straight tree which grows throughout most of the Interior. Needles occur in bunches of two and are often twisted in a spiral with sharp points; usually dark green. Seed cones vary in shape from short and cylindrical to egg-shaped; 2 to 4 centimetres long without stalks. The seed scales have sharp prickles at their tips. The bark is thin, orangey-brown to grey, and finely scaled. It grows throughout the Interior, from mid elevation to subalpine sites. Lodgepole pine is a highly adaptable tree that can grow in all sorts of environments, from water-logged bogs to dry sandy soils. Lodgepole pine is one of the first trees to invade after a wildfire. 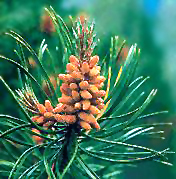 Its cones are protected by a seal of pitch that requires fire or heat to release the seeds. This allows seeds to stay on the tree or on the ground for many years until disturbance provides suitable growing conditions. 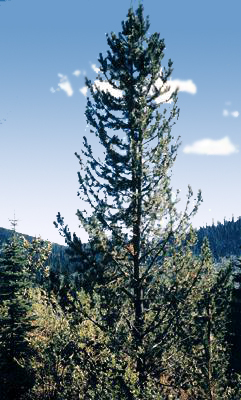 Lodgepole pine can occur as the only tree in dense, very slow-growing groups of trees (so-called "dog-hair" stands). 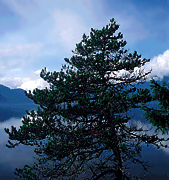 Many First Nations peoples in British Columbia used the wood from lodgepole pine for a variety of purposes, including poles for lodges, homes or buildings. In the spring, they stripped off long ribbons or "noodles" of the sweet succulent inner bark (cambium layer). It was eaten fresh in the spring, sometimes with sugar, or stored. The pitch was used as a base for many medicines. It was boiled, mixed with animal fat, and used as a poultice for rheumatic pain and all kinds of aches and soreness in muscles and joints. Pitch was also chewed to relieve sore throats. Lodgepole pine is excellent for lumber, plywood, and paneling. It is used to make doors, windows and furniture, as well as railway ties, mine props and fence posts. Another variety of Pinus contorta (var. contorta), called shore pine, grows in a narrow band along the coast. It commonly grows as a short, scrubby, crooked tree. This two-needled pine has thick, deeply grooved, dark reddish-brown bark. 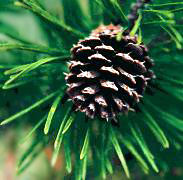 In the extreme northeastern part of the province, another two-needled pine grows: jack pine (Pinus banksiana). Its cone scales have no prickles at the tip. Older lodgepole pine trees are susceptible to mountain pine beetle. The beetle tunnels under the bark and lays its eggs. As the tree dies the colour of the needles changes from green to rusty-brown. Lodgepole pine is also susceptible to mistletoe, rusts, and root rot. It provides food for many small mammals (e.g., snowshoe hare, vole, and squirrels) which feed on the inner bark.